The Government yesterday stepped up relief effort for victims of the Meethotamulla garbage tragedy announcing a slew of new measures. 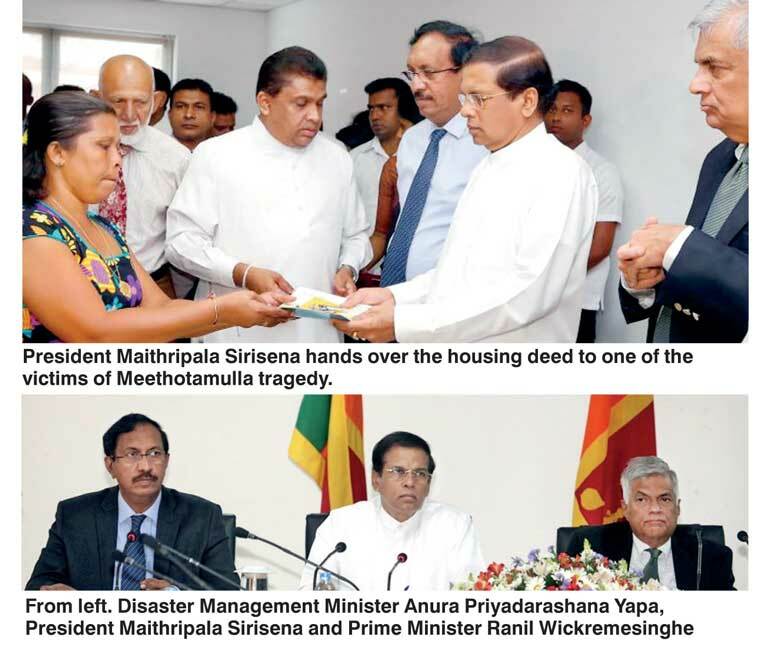 Under the first phase of the initiative, President Maithripala Sirisena yesterday presented deeds of new houses to 30 families whose homes were fully destroyed due to the collapse of a section of the Meethotamulla garbage dump. Yesterday’s recipients were those who had expressed the need to get new homes. The remaining families out of a total of 60 who lost their homes will be provided housing deeds after expression of interest is communicated. For those wishing financial compensation in lieu of houses will be provided accordingly, based on assessed value which is still pending. If the values of the destroyed houses exceed the calculated value, the difference will also be paid in cash to respective families, in the future. The President’s Office said the Government will be spending Rs. 392 million on new houses. New relief measures were decided and directed as per the instructions of President Maithripala Sirisena and Prime Minister Ranil Wickremesinghe during the third progress review meeting since the collapse of garbage mountain on 14 April killing 32 people. Previously, the Government announced victims would be given Rs. 250,000 to purchase furniture while Rs 10, 000 would be given for transportation of their belongings. At the meeting, it was also decided to pay a monthly allowance of Rs. 50, 000 and a transport allowance of Rs. 10, 000 for each family that will move away from the declared danger zone until they are provided full compensation or a permanent dwelling. The relevant ministries, on the instructions of the President and the Prime Minister, agreed to provide a house or the assessed compensation to the victims within three months. The President instructed the relevant officials to pay a fair compensation on the assessed value to the families, who may not be willing to receive a new house. Those obtaining compensation will also be given the proposed allowance for transportation and furniture. The Government Information Department said that so far, it has been concluded that there are 60 totally damaged houses while 22 partially damaged houses are located in the danger zone and this program will be applied for 211 houses immediately. The National Housing Development Authority has decided to write off housing loans given to the affected house owners in Dahampura and Pansalhena areas. Accordingly, the housing loans obtained not only by the residents in those areas but the residents in the danger zone will also be abolished. The Prime Minister pointed out the necessity of drafting a national policy on removing of solid waste to prevent such tragedies in the future. It was also decided to convene a meeting once a week under the patronage of the President with the participation of the Prime Minister, relevant ministers, and other officials to discuss and plan an immediate program. The Prime Minister also instructed the Colombo Municipal Council and the Treasury to reimburse the total amount of money to the National Housing Development Authority for the houses given. President Sirisena meanwhile instructed the officials to create a program to disseminate correct information through media on the relief given to the victims. Ministers Anura Priyadarshana Yapa, Susil Premajayantha, Patali Champika Ranawaka, Mahinda Samarasinghe, Faizer Mustafa, Sagala Rathnayake, Vajira Abeywardena, A. H. M. Fawzie, Chief Minister of Western Province Isura Dewapriya, Commanders of tri-forces and the Inspector General of Police also took part in the meeting. President Maithripala Sirisena has instructed public officials to formulate a program to solve the issue of solid waste management and make necessary arrangements to vest power therein with a central authority. The President issued this directive at a meeting held at the Ministry of Disaster Management to review the progress of ongoing relief efforts for families affected by last week’s garbage dump collapse in Meethotamulla. A program to provide houses for displaced persons whose houses were completely destroyed was launched yesterday under the guidance of President Sirisena, expediting the resettlement process. Sirisena also directed the Secretary to the President to take actions to call a continuous discussion with the participation of the Prime Minister, Ministers and other officials till solutions are found to the current issues. These discussions will be held before the next Cabinet meeting. Former President Mahinda Rajapaksa stated that the Meethotamulla landfill site did not receive much attention in the past, as the civil war at the time had to be given priority. He said that although a plan was made to deal with the issue towards the latter part of his time as President, there wasn’t enough time to execute the plan fully. Rajapaksa made these comments in response to questions raised by reporters after his visit to the Sri Maha Bodhiya in Anuradhapura.